After visiting Robyn Story two weeks ago, I can’t get my mind off large mirrors, and the power they have to transform a space. Robyn’s store ( you can read more about it in my post, here), is filled with gorgeous mirrors, each more stunning than the next. So, yesterday when I should have been painting, I decided to check out some of my favorite sources to see what they had in the way of really big mirrors. Horchow always has things I lust after that are usually way over my budget. I also decided to see what was available in one of my favorite local antique malls. I found tons of impressive oversized mirrors, and although not inexpensive, all were priced considerably less than the ones at Horchow. Here are my two of my favorites. They are the roughly same size and priced within a few dollars of each other (before any negotiating). All things being equal, which one would you choose? The last one is my favorite! 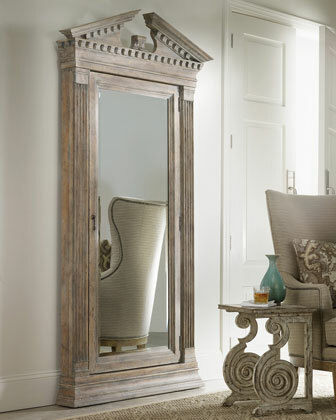 The mirror with flat top is traditional, yet looks more fresh and current than the one with curved top. I would go with the flat topped one. I like both but the first one is my pick! The bottom one looks too chunky and heavy but it would depend on where it is going. The top one could lend some very interesting layering with the chalk paint and dark wax. But, I know you will make either one beautiful!